If you do not yet have a child old enough to whine, let me assure you it is one of the most frustrating habits a child can pick up. I have a few posts on how to handle whining once it is a problem, but as in all things, preventing bad habits is easier in the long run than trying to fix bad habits. On Becoming Babywise Book Two discusses how to work toward the prevention of whining, starting on page 49. “[Whining] can happen as soon as your child begins to communicate ideas” (page 49). The authors point out that initially, whining is half-hearted and not done out of rebellion. They do caution, however, that it can become a habit and become a method used to get what the child wants. Whining prior to 15 months is usually due to a limited vocabulary. I would add there will be children out there who still have vocabulary limitations beyond 15 months. 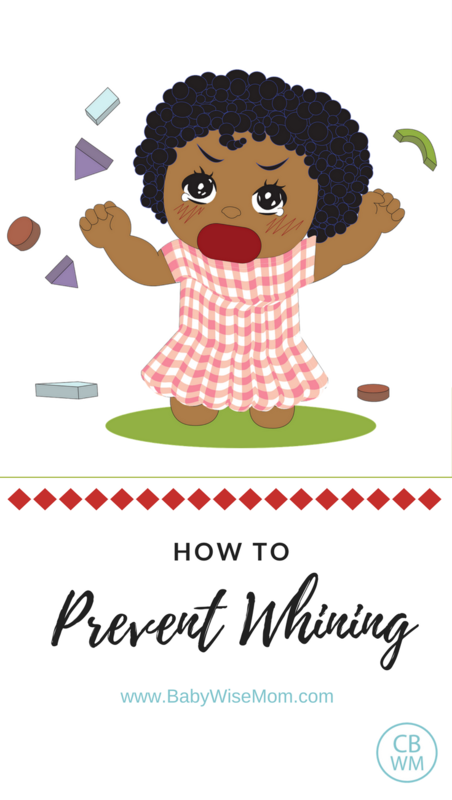 I think just about everyone, parent or not, can answer this question correctly: How to you prevent (or stop) whining from becoming a habit? Did you say something like, “Don’t give into it?” Sure. We all know that on an intellectual level. The trick is stopping ourselves from giving into it–we often do without realizing it. Your 10 month old wants more food, but can’t talk, so she whines for some. Her intentions are not bad–she just wants more food and is doing what she thinks will be the most effective way to let you know. If, however, you respond by giving her more food (her motives are innocent after all), you are teaching her that whining works. Whining is effective. You are giving in to her whining. If you don’t think she is smart enough to catalog this in her brain, you greatly underestimate her intelligence. So what do you do? You work to give her ways to communicate without whining. A very effective way to do this is sign language. I love the tool of sign language. A 10 month old is more than capable of signing simple signs to you. “More,” “Please,” “Thank you” etc. If you have a younger baby, start signing to your baby now. With Brayden, I didn’t worry too much about signing. He started talking around 7-8 months old, so I felt signs weren’t necessary for him. However, at 14 months old I introduced some signs and it really helped in a lot of situations. Because of that, I started showing signs to Kaitlyn at 5 months old. She was even more verbal than Brayden, but started signing to me around 7-8 months old. She even would sign “all done” when nursing. I loved that. With McKenna, we also did signs. Signs are valuable no matter the age or verbal abilities of your child. I encourage you to use them to help prevent whining, whether at the table or at play. Agreed! Teaching your baby sign language is a huge gift to them and also a second language. They enjoy communicating with you what they want/need and it's fun as a parent learning new signs to teach them once they know the basics. There is a lot of positive research about doing this! This is a great reminder. While reading this I realized that that's exactly what I do—my 12 month old hasn't picked up on signs yet and he whines a lot during mealtime when he wants more. i realize I need to be MUCH more consistent with signing and try to not encourage whining! Thanks! Yes, yes, YES! You are right on the money! I taught my daughter signs not because I wanted to be SuperMom showing off her SuperSmart child, but because I can't stand whining! When my 12 month old son whines for more food, I tell him "no Andrew, ask for more." Then I do the more sign, I pick up his hands and make him sign for more, I applaud him, and give him the food. This worked great for my daughter, and I'm ready for Andrew to start picking it up as well. My son is a month old and I just started the Babywise schedule 1 week ago. I seem to have the idea down of feed, wake, sleep; however his naps during the day are so inconsistent. He sleeps for 30 minutes and then cries. I have gone down the list of checking for pain, gas etc… He is not a snacker, he's really good about finishing a meal when nursing, he just won't sleep for the full nap time. I'm only keeping him up for 44-60 minutes including feeding time and we are on a 2.5 hour schedule. I feel like he cries more than sleeps. I do go in and soothe him during naps if I feel like he is inconsolable. Is this normal for this age and stage of Babywise? The best sign to teach is "Help." It prevents so much whining! Google it to learn how to do this one, or pretty much any other sign. Seriously??? Thank you, Jesus! !…I am dealing with Mr. Grumpy Gills am at my wits end…decided to see if Babywise Mom had a section on Whining and whaddaya know it's the post of the day! Thank you soo, soo much. Thank you everyone for your comments and you are all welcome! kcharvonia,it is normal for that stage in self-soothing. I would suggest when he wakes early you move him to a swing or rock him back to sleep. As he gets better and self-soothing, he will be able to make it through the transition. Thank you for this post. Logically not giving in makes total sense. However, my 14 month old has been really uninterested in sign language (we've been working on more, all done and please since about 9 months). When I try to teach him in the moment where he's whining, it seems to compound his frustration. Then he's just mad and the teaching moment seems to be missed because he's too upset to pay attention. Any suggestions for progressing beyond this? The whining is making me cuh-razy!! !